1) If you are a new user, sign up here and get additional SWFTCoin! Share the following poster and text to Telegram groups and Twitter, take screenshots and send to SWFT Blockchain group tag admin @acsd0627 and @Ronjet_SWFTblockchain. If approved, you will be rewarded! Valid until April 19, 2019! 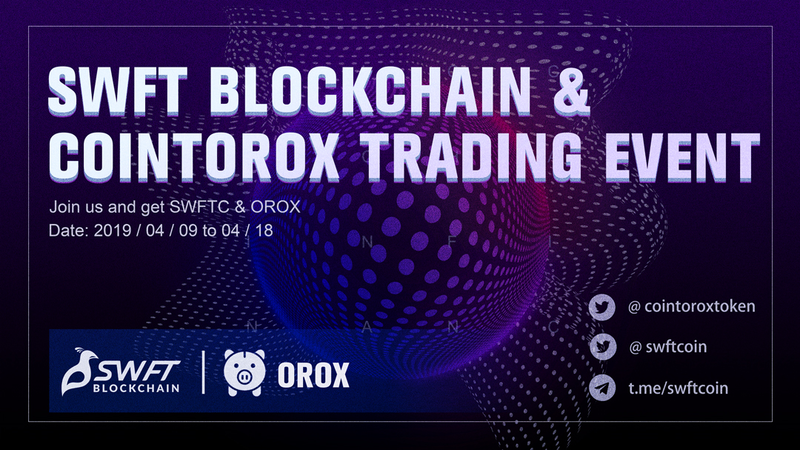 “Join @swftcoin and @cointoroxtoken partnership #celebration and you can win up to 15,000 $OROX and 20,000 $SWFTC. 🔥 The SWFT Blockchain and Cointorox teams reserve the final rights of explanation regarding all rules and regulations of this event. 🔥 All rewards will be distributed within 5 business days after the event. 🔥 If we detect any cheating activities during the event, SWFT Blockchain is entitled to disqualify the users involved from claiming their rewards.